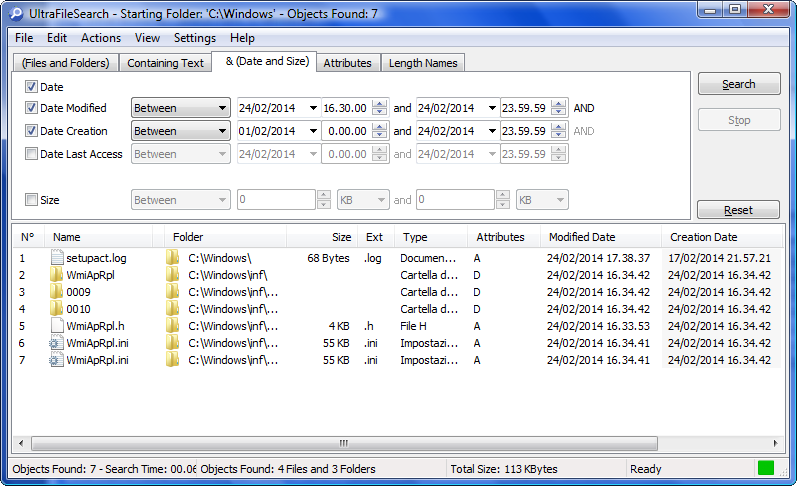 UltraFileSearch allows you to specify several File Names and multiple Drives and/or Folders at the same time; it is able to sort out Files and Folders according to their properties (e.g. 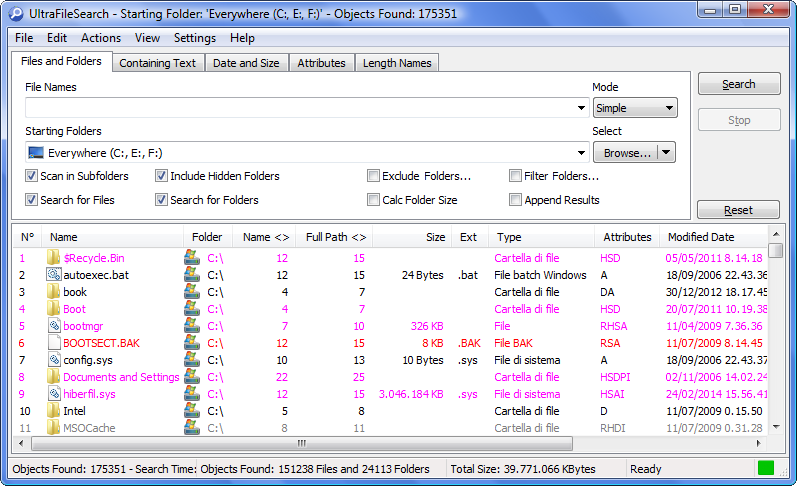 Modified Date) and find Files which contain one or more specific words or sentences. The search results can be put in order by column (upward, downward or neither of them). 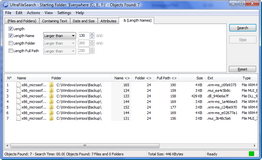 The results window supports Windows® Explorer functionality (e.g. icons, context menus). Specific actions can be carried out on the results (e.g. 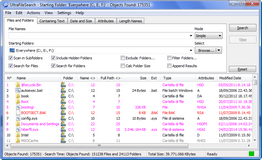 Open Folder, Open Containing Folder), moreover they can be exported in various File Formats (*.TXT, *.TSV, *.CSV, *.HTML, *.XML). 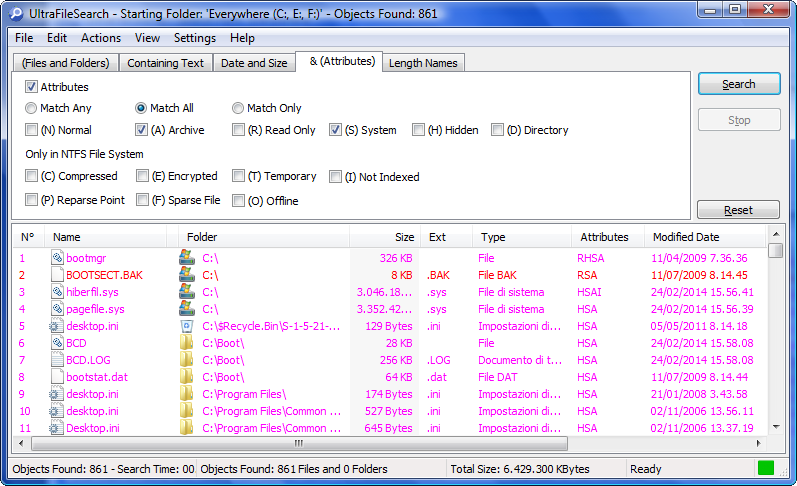 Search Files or Files and Folders or only Folders in any NTFS or FAT File System in your internal or external Hard Drives, Network Drives, Discs (e.g. CD-ROM, DVD), USB Flash Drives and any other Devices and File Systems recognized by the Operating System. 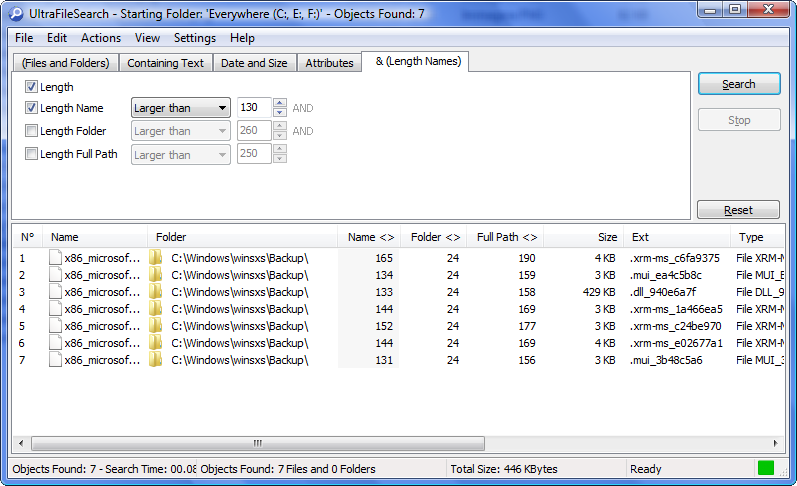 You can create a multi-Folder, which contains a list of Drives and Folders to Include and Exclude from the search process, give it a Mnemonic Name and use it later with a simple click. 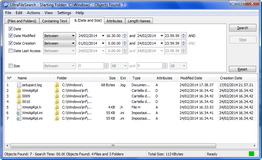 It is also possible to build a general list of Folders to be excluded and also a list of Names to filter Folders. 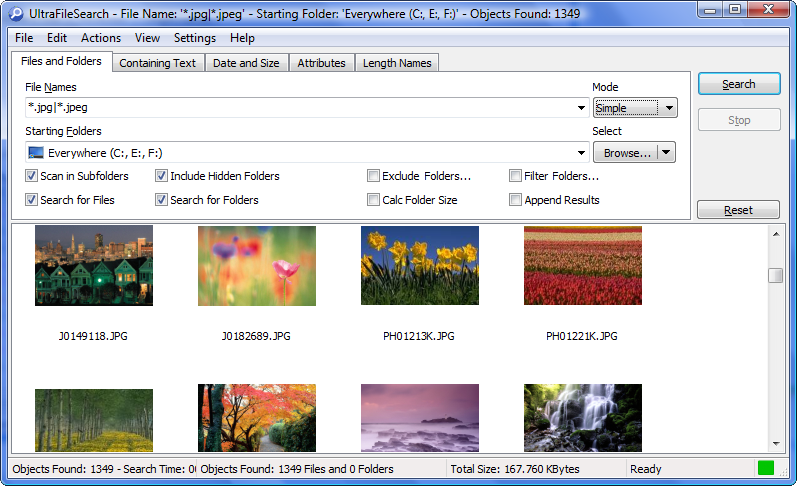 You can specify the File Name in a Simple mode or using Wildcards. 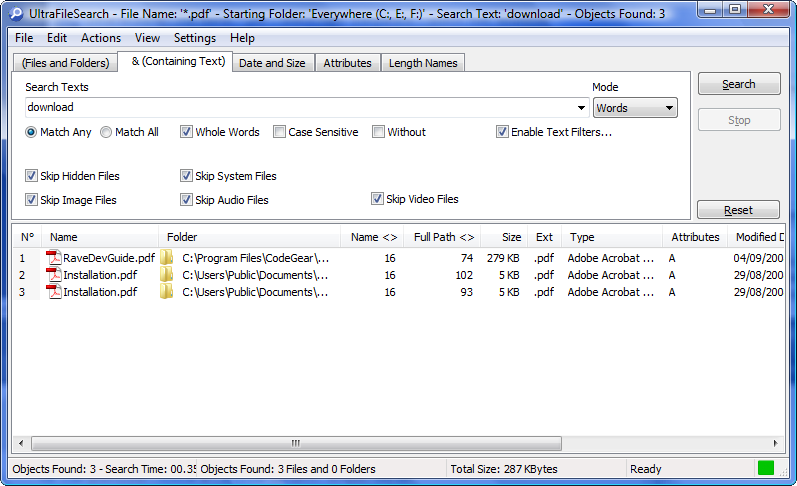 You can find Words or Phrases inside Plain Text Files or Encoded Documents using the Text Filters	built-in with the Software or the IFilters. 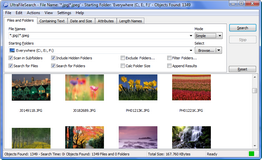 You can also search by Date and Size, Files and Folders Attributes and by Filename, Folder, or Full Path Lengths. You can Cut and Copy Files to the Clipboard, Copy or Move them to a selected Folder, Delete and Rename Files and create Shortcuts on the Desktop, source Folder, or a selected Folder. Also the Filenames to be renamed can be edited one by one or all at once. The Batch rename feature enables you to apply various rules to Remove Characters or Strings from the Filename, Replace Characters or Text from the Filename and Change Case to lower/UPPER/etc., Insert Sequence and Text and also modify File Extension. 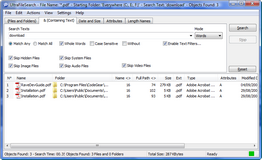 The preview of the new Filename is automatic. The Results Export functionality lets you choose which Columns to Export and in what order, the destination: Clipboard/File, the File Format: FullPath/.TXT/.TAB/.CSV/.HTML/.XML and the Encoding: ASCII/ANSI/Unicode/Big-Endian Unicode/UTF8/UTF8 No BOM.